The Witness is the next free title in the Epic Games Store. It will be available to download between April 4 and April 18, and will be free-to-keep. It’s not another free weekend promotion. 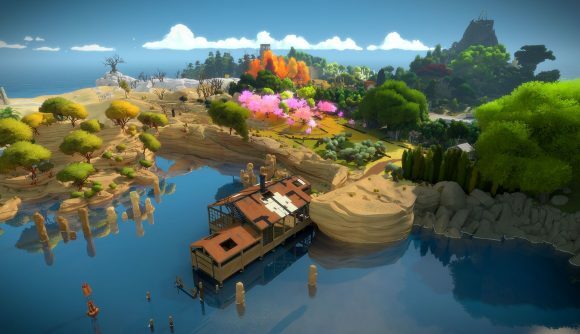 The Witness was released back in 2016 and sees the player wake up on a strange and beautiful island where they must solve strange, challenging and long-winded puzzles. The Witness generally received positive reviews when it was released, and if you haven’t yet had the chance to pick it up, I fully recommend giving it a go while you can. It’s currently priced $39.99 on Steam. The most recent game offered free by Epic Games is Oxenfree, which sees players control a pair of teenagers in a ghostly side-scrolling platform adventure. Before that, Epic gave out the hugely popular Slime Rancher in its bid to prove its online store is a serious contender in the digital games market. The Epic Games store launched at the end of last year and has already caused a stir, attracting exclusives such as Metro Exodus, which has gone on to sell more copies than its predecessorMetro: Last Light sold on Steam. More recently at GDC, Epic announced that it would bring Heavy Rain, Beyond: Two Souls, and Detroit to PC for the first time, with a year-long exclusivity deal. The news came as excitement to fans of David Cage’s highly narrative games, which have previously only been available on Playstation.